A new scam to hit this area is the Walmart Check Scam. 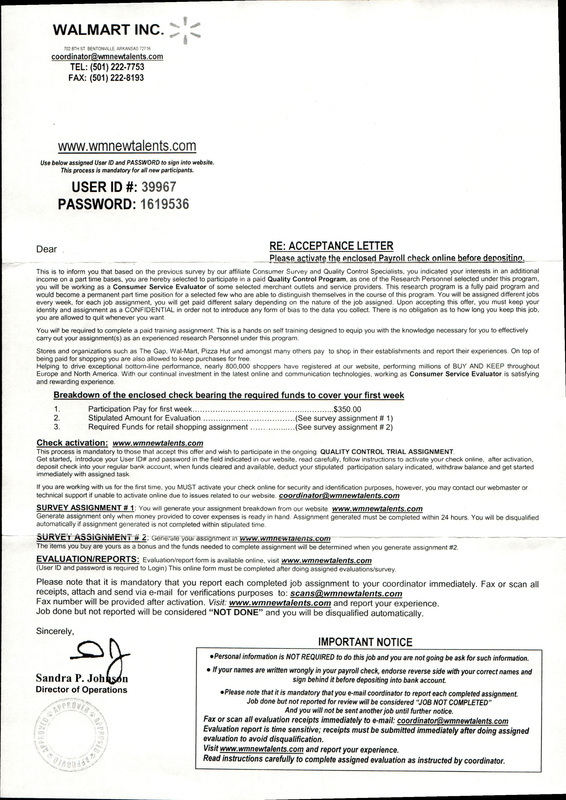 A person receives a letter, like the one below, in the mail along with a check, like the one pictured above. The letter informs the person that they have been accepted into the Quality Control program from Walmart. The letter informs the person of their responsibilities. A check activation is required using a supplied user ID and password. Once the check is activated, the person is to deposit the check into their bank account to begin shopping and participating in the program. Once you deposit the check into your account, the scammers drain your account. DO NOT DEPOSIT THIS CHECK. If you receive this letter in the mail, throw it away.